One of my goals for this summer was to take our neglected deck and turn it into an area that was much more well-equipped for entertaining. Instead of the dilapidated porch swing, it was time to bring in comfortable seating, modern decor, and a little color to brighten up the space. After all, what fun is a barbeque if everyone just has to sit on the ground or pull up a folding chair? After bringing home a small patio set that was perfect for two or for setting out food and drinks, we were on the right start. But how could we provide a place to sit and rest or eat for adults but leave out the kids? 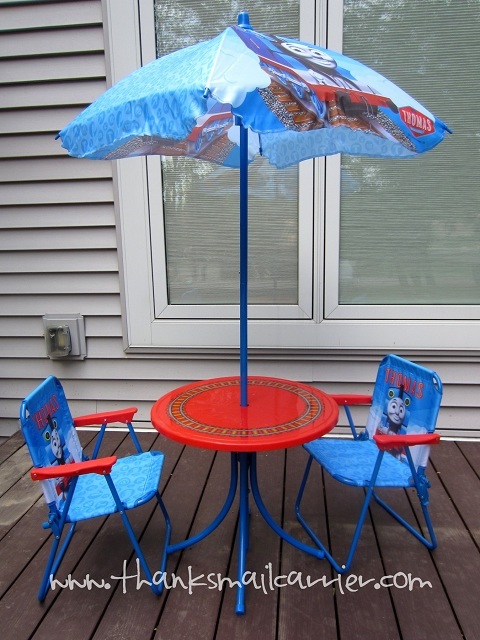 Fortunately, we found the fun, just-the-right-size solution in the form of the Thomas the Tank Engine Patio Set from JAKKS Pacific. As a leading toy and consumer products company, JAKKS Pacific focuses on traditional products and play patterns, and incorporates classic and popular brands, as well as simple innovation and technology, to make them appealing to today's kids and consumers of all ages. With items falling into categories for indoors, outdoors, preschoolers, interactive, pets and more, JAKKS Pacific has something to fit every boy or girl's tastes. Both of my girls know Thomas the Train well and were thrilled when they saw me bring out the box containing this table and chairs set. I always appreciate when a company sends children's products that are fully (or almost fully) assembled, as there's nothing worse than having eager (i.e. impatient) kids who want to try something out and don't want to wait while you search around for a screwdriver. 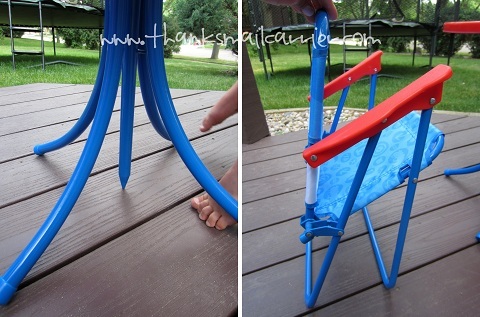 Fortunately, this kids' patio set arrived in eight pieces that snapped together in barely more than a minute. 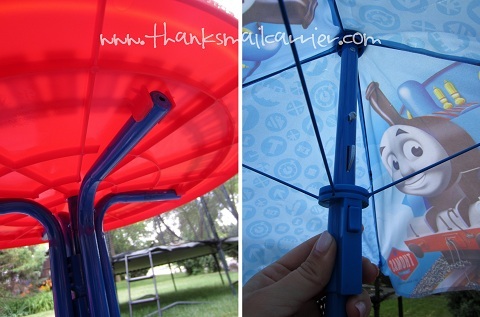 ...and slid the umbrella stand right down through the hole in the middle of the table. If this set was placed on the ground, the end of the umbrella stand would easily poke right into the dirt, helping keep the whole set steady. ...we were set to go! Perfect for indoor or outdoor use, the recommended weight limit for each chair is 60 pounds, making this a great set for ages 3 - 7 (depending on the height of your child as well). My girls eyes lit up when they saw how quickly this came completely together! 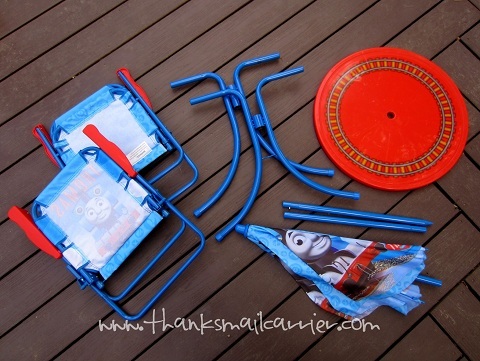 Right away I was happy with how lightweight and easy the Thomas the Tank Engine Patio Set is to move, as my kids had to try it out in various places around the deck. 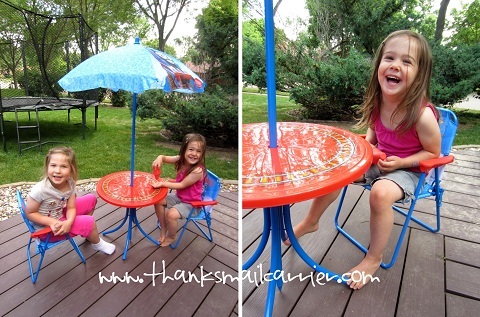 Regardless, they were excited about having their own kid-sized table and chairs and they loved the in-laid graphics on the table and the bright colors and designs on the chairs and umbrella. 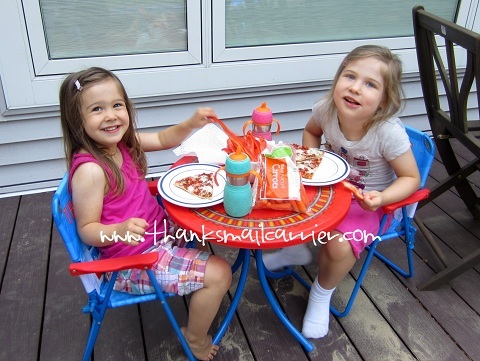 Sure enough, that night for dinner they were clamoring to eat outside, so we were able to find that this set not only was fun to look at, but it worked perfectly fine for practical purposes as well (and the washable top cleaned up quickly and easily). 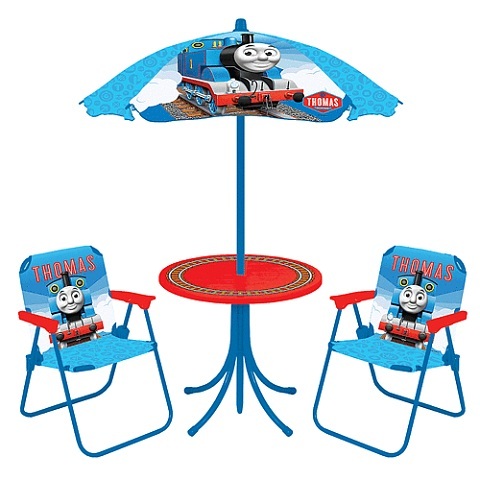 Great for outdoor patios, decks or just in the yard, the Thomas the Tank Patio Set would also work just as easily indoors (minus the umbrella) for a child's art table or as part of pretend play. We did find that we had to be careful when the girls were trying to scoot their chairs closer to the table, as it tended to cause them to start to fold up. However, when the girls were seated and staying in place, each piece proved to be plenty durable and made to last. 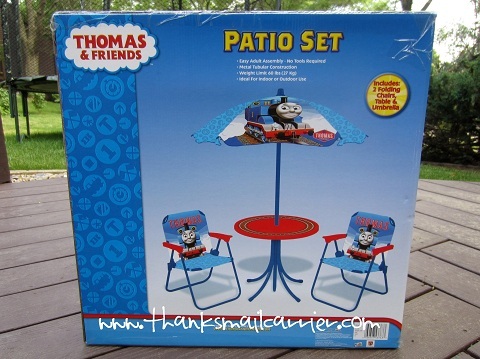 Retailing for $34.99 from Toys 'R Us and Walmart.com, you can find out more about the Thomas the Tank Engine Patio Set from JAKKS Pacific, as well as connecting with them on Facebook and Twitter. Or, maybe you have a younger Thomas fan in your life that would prefer a seat of their own? Head over to Rave & Review and see how much they've been enjoying the Thomas & Friends Toddler Swing! Adorable! Looks like they like having their own patio furniture! It's perfectly sized for the girls! But where's the third chair for Aunt Liz? The Ipad app is so cute!